Following is a list of common questions we receive. If you have a question not listed below, or would like to make an enquiry, please contact us. 1. How do I check how much LPG is left in my cylinder? The level of gas in a full cylinder is approx three quarters of the height of the cylinder. This allows the gas to expand and contract during different weather conditions and temperatures. You cannot tell how much gas is in a cylinder by shaking or tapping it. This could also damage the container. To check the level of gas in a cylinder, carefully pour hot water down the side of it and then after a few moments, run your hand down the cylinder. It will feel cool to touch at the level of the gas. Of course exercise caution when handling the hot water. 2. What to do if you can smell gas? Check to see if any pilot lights have gone out on your appliances. Check if any burners on your stove have been accidentally turned on. 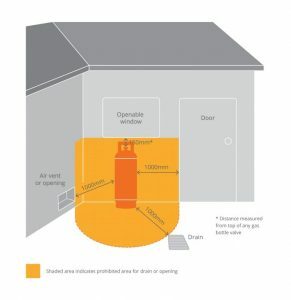 Check to see if connections to your gas cylinder or gas appliances are loose. Check to see if your gas cylinder is close to empty, as the gas at the bottom of the cylinders may smell stronger – even if it isn’t leaking. 3. What to do if I have a gas leak? 4. When can I expect delivery? We operate a daily service for the delivery of gas cylinders though out the city. Each day is scheduled for a particular area. Your delivery day will be notified to you upon your first order of cylinders, otherwise please view our cylinder delivery roster below. All orders must be placed before 4pm the day before your designated delivery day. Either by phone, email, online or over the counter. Ensure cylinders are accessible for the delivery driver – i.e gates unlocked and clear path way to cylinder point. Aggressive or escaping dogs must be locked up. Fees may apply if these regulations are not met. LPG stands for Liquefied Petroleum Gas and is a flammable mixture of hydrocarbon gases used as a fuel in domestic and industrial heating appliances. In Australia, LPG is usually made from propane or butane gas, or a mixture of both. It is an ideal fuel for heating and cooking because it burns readily in the air, and its short lifetime in the atmosphere and low carbon content means its greenhouse emissions are minimal. So LPG is a good friend to the environment. LPG is a great alternative energy source because it is easy and safe to use, simple to transport and store. 6. What is the best placement of cylinders? It is very important that cylinder placement meets the applicable Australian Standards for all new LPG installations. 7. 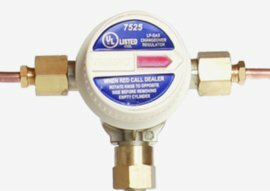 How do I operate the gas cylinder changeover valve? Your gas supply will stop when a gas cylinder is empty. 1. Turn the hand wheel on the empty gas cylinder OFF (clockwise). 2. You then move the changeover valve lever to point towards the other (full) gas cylinder. 3. Turn the hand wheel on the full gas cylinder ON (anti-clockwise). 4. Please remember to order a replacement gas cylinder so you don’t run out. 5. Please note that, in the picture shown, the lever (blue) is pointing upwards just to make it more visible. In actual use it would be set to the left or right. These automatically switch from one gas cylinder to another, when one is empty. To do this, both gas cylinder valves are left in the OPEN position. Several types of automatic changeover valves are available. 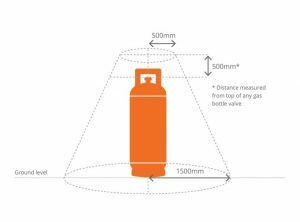 All use a visual indicator to show you when a gas cylinder is empty and it has switched over to the other gas cylinder. The indicator typically turns red when the first cylinder is empty. Do not touch or turn the indicator. When it turns red, that’s your signal to call North Regional Gas for a delivery. We will replace the empty cylinder with a full one and reset the indicator. 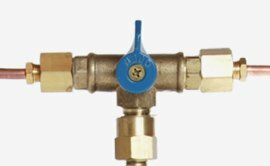 If you have an automatic changeover valve, you do not need to do anything. However, you won’t have the manual changeover process as a reminder to order more gas, so be sure to check your gas bottles regularly. 8. Do I need to organise for my cylinders to get tested? All gas bottles are required to be inspected and tested to make sure that are safe to use. We do this for you as part of the Annual Safety Fee so you don’t need to worry! Cylinders are stamped at the time of testing. Out of date cylinders CAN NOT be refilled. 9. What is the safest way to store and transport gas bottles? Gas cylinders must always be in an upright position on a solid base. They cannot be stored indoors. When transporting gas bottles they must be in a trailer or utility and firmly secured. 9kg cylinders (BBQ bottles) can be transported in the boot of your car (no more than two at a time). 10. Are there regulations I need to be aware of regarding the safety and management of gas? Each state has different regulations for the gas industry. These regulations help control the standard of work and safe use of LPG. 11. What are the Regulations applying to Gas Installation? Clear access – Locked gates, steep driveways, uneven pathways, low-hanging trees, lots of steps and unrestrained dogs are all items which can prevent a gas truck and its driver from accessing your property. No obstructions – The space around your gas bottle installation also needs to be kept clear. Be sure to keep the area free of shrubs, wood, bins, rubbish and other household items.